The People's Liberation Army (PLA) Rocket Force conducted a simulated intercontinental ballistic missile (ICBM) strike mission from an underground bunker against an imaginary enemy, the country's national television reported Monday. China Central Television (CCTV) did not disclose details on the location and time of the exercise. Long-term survival training in closed environments has become routine for the troops to ensure counterattack capability in case a war breaks out, the report said. Song Zhongping, a military expert and TV commentator, told the Global Times on Tuesday that China's strategic missiles are usually placed in deep, protective bunkers. As China promises never to use nuclear weapon first and will only use them in a counterattack, China's strategic missile storage facilities must be able to survive the first wave of hostile nuclear strike, Song said, noting that the underground bunkers are invaluable in protecting Chinese missiles from being destroyed and prepare for counterattacks. China's highest science and technology award of 2018 was given to academician Qian Qihu for his achievements in fortifying these nuclear defense facilities. PLA troops have experienced three weapon upgrades in the past 60 years, and missiles now have a longer range, and are more accurate and more powerful, CCTV reported. Song said the three generations of ICBMs could be the DF-5, DF-31 and DF-41, all of which are capable of striking targets more than 10,000 kilometers away with a deviation of less than a few dozen meters, carrying single or multiple thermonuclear warheads. Without a first strike against China, China will never use the weapons, analysts stressed. 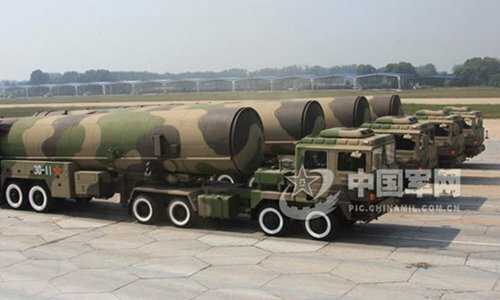 The DF-41, China's mysterious and most advanced ICBM, might make its public debut on October 1, the 70th anniversary of the People's Republic of China's founding, as a military parade is expected to be held in Beijing on that day, Song said. An ICBM loaded with nuclear warheads will likely never be used as it would precipitate an all-out nuclear war, say analysts. The weapon's primary purpose is deterrence, and to facilitate political and diplomatic discussions.